HOUSTON, TX --- September 12, 2011 --- It has been a long road for the "Dukes and Duchess of Albuquerque" and the "River City Raiders," but their dedication and hard work have paid off as both teams have emerged as finalists in this year's J-Team All Stars Championship competition. Now in its third year, the J-Team All Stars Championship challenges participating franchisee employee teams, called J-Teams, to showcase their training while delivering the core Jiffy Lube service --- the Jiffy Lube Signature Service® Oil Change. Hosted by Jiffy Lube International, the competition culminates on Sept. 18 as the Eastern and Western Champs face-off in Chicago for the title of J-Team All Stars Champion and a $10,000 grand prize. "This competition is a unique initiative for Jiffy Lube and the industry, highlighting the training of service center employees and the quality of service while driving employee engagement and excitement," said Stu Crum, president of Jiffy Lube International. "This year's finalists and all the participating teams demonstrate what the competition is all about --- empowering service center employees to showcase the knowledge and expertise that helps them deliver a top-notch customer experience every day. We take great pride in the training programs we offer to Jiffy Lube franchisees and their employees, including the nationally-recognized Jiffy Lube University, and this event is the peak of those efforts." The top two J-Teams, who emerged from an original pool of nearly 1,500 participating Jiffy Lube service center teams from across the United States and Canada, will be the center of attention at the Grand Finals event in Chicago -- the fifth and final round of the Championship. The "Dukes and Duchess of Albuquerque" from service center #2951 in Albuquerque, N.M., owned by Lubricar, Inc., is this year's Western Champion. Team members include: Phillip Lopez, customer service advisor; Justine Baca, upper bay technician; Shaun Whetten, lower bay technician; Mitch Garcia, courtesy technician; and Jason Coyle, team leader. "I'm so proud of this team for making it this far in the competition. Watching them excel through the first four rounds convinces me they deserve to be participating in the finals," says Keith Mortensen of Lubricar, Inc., a Jiffy Lube franchisee. "I'm really looking forward to watching them compete in Chicago." This year's Eastern Champion is the "River City Raiders" team from service center #285 in Fort Wayne, Ind., owned by Indiana Lubricants, Inc. Their motto? "Practice makes perfect." And with more than 11 hours of practice each day, six days a week, the team has certainly proven how badly they want to bring home the title. Team members include: James McHenry, customer service advisor; Bill Hines, upper bay technician; John Bixler, lower bay technician; Maurice Rogers, courtesy technician; and Lora Otto, team leader. "It's been great watching this J-Team work together to further hone their skills and teamwork to make it to the finals," says Steve Sanner of Indiana Lubricants, Inc., a Jiffy Lube franchisee. "They always go above and beyond for the customer, and their passion and commitment to excellence is something I hope to see rewarded." At the Grand Finals event, the J-Teams will be judged by Jiffy Lube International District Managers on their teamwork, operational execution and customer experience skills as well as how quickly they perform a Jiffy Lube Signature Service® Oil Change, a preventive maintenance service that involves changing, inspecting, checking/filling and cleaning essential vehicle components. In addition to the $10,000 team grand prize and the title of Jiffy Lube J-Team All Stars Champion for the winner, the runner-up will receive a $5,000 team prize. To find a Jiffy Lube in your area, please visit Locations.JiffyLube.com. 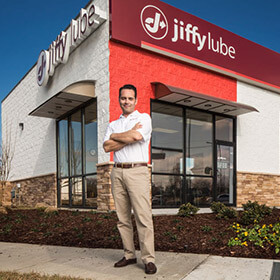 Visit JiffyLube.com to find oil change coupons and promotions, Jiffy Lube news articles, community involvement programs and events, franchise information and employment opportunities. Also, anyone can visit the new Jiffy Lube Facebook community, "Keeping My Ride Alive," to view photos and stories from drivers committed to extending the life of their vehicles, as well as upload photos and stories of their own. Royal Dutch Shell plc is incorporated in England and Wales, has its headquarters in The Hague and is listed on the London, Amsterdam and New York stock exchanges. Shell companies have operations in more than 100 countries with businesses including oil and gas exploration and production; production and marketing of Liquefied Natural Gas and Gas to Liquids; manufacturing, marketing and shipping of oil products and chemicals and renewable energy projects including wind and solar power. For further information, visit www.shell.com. The companies in which Royal Dutch Shell plc directly and indirectly owns investments are separate entities. In this press release "Shell", "Shell group" and "Royal Dutch Shell" are sometimes used for convenience where references are made to Royal Dutch Shell plc and its subsidiaries in general. Likewise, the words "we", "us" and "our" are also used to refer to subsidiaries in general or to those who work for them. These expressions are also used where no useful purpose is served by identifying the particular company or companies. ''Subsidiaries'', "Shell subsidiaries" and "Shell companies" as used in this press release refer to companies in which Royal Dutch Shell either directly or indirectly has control, by having either a majority of the voting rights or the right to exercise a controlling influence. The companies in which Shell has significant influence but not control are referred to as "associated companies" or "associates" and companies in which Shell has joint control are referred to as "jointly controlled entities". In this press release, associates and jointly controlled entities are also referred to as "equity-accounted investments". The term "Shell interest" is used for convenience to indicate the direct and/or indirect (for example, through our 34% shareholding in Woodside Petroleum Ltd.) ownership interest held by Shell in a venture, partnership or company, after exclusion of all third-party interest. This press release contains forward-looking statements concerning the financial condition, results of operations and businesses of Royal Dutch Shell. All statements other than statements of historical fact are, or may be deemed to be, forward-looking statements. Forward-looking statements are statements of future expectations that are based on management's current expectations and assumptions and involve known and unknown risks and uncertainties that could cause actual results, performance or events to differ materially from those expressed or implied in these statements. Forward-looking statements include, among other things, statements concerning the potential exposure of Royal Dutch Shell to market risks and statements expressing management's expectations, beliefs, estimates, forecasts, projections and assumptions. These forward-looking statements are identified by their use of terms and phrases such as ''anticipate'', ''believe'', ''could'', ''estimate'', ''expect'', ''intend'', ''may'', ''plan'', ''objectives'', ''outlook'', ''probably'', ''project'', ''will'', ''seek'', ''target'', ''risks'', ''goals'', ''should'' and similar terms and phrases. There are a number of factors that could affect the future operations of Royal Dutch Shell and could cause those results to differ materially from those expressed in the forward-looking statements included in this press release, including (without limitation): (a) price fluctuations in crude oil and natural gas; (b) changes in demand for the Group's products; (c) currency fluctuations; (d) drilling and production results; (e) reserve estimates; (f) loss of market share and industry competition; (g) environmental and physical risks; (h) risks associated with the identification of suitable potential acquisition properties and targets, and successful negotiation and completion of such transactions; (i) the risk of doing business in developing countries and countries subject to international sanctions; (j) legislative, fiscal and regulatory developments including potential litigation and regulatory effects arising from recategorisation of reserves; (k) economic and financial market conditions in various countries and regions; (l) political risks, including the risks of expropriation and renegotiation of the terms of contracts with governmental entities, delays or advancements in the approval of projects and delays in the reimbursement for shared costs; and (m) changes in trading conditions. All forward-looking statements contained in this press release are expressly qualified in their entirety by the cautionary statements contained or referred to in this section. Readers should not place undue reliance on forward-looking statements. Additional factors that may affect future results are contained in Royal Dutch Shell's 20-F for the year ended December 31, 2008 (available at www.shell.com/investor and www.sec.gov). These factors also should be considered by the reader. Each forward-looking statement speaks only as of the date of this press release, September 12, 2011. Neither Royal Dutch Shell nor any of its subsidiaries undertake any obligation to publicly update or revise any forward-looking statement as a result of new information, future events or other information. In light of these risks, results could differ materially from those stated, implied or inferred from the forward-looking statements contained in this press release. The United States Securities and Exchange Commission (SEC) permits oil and gas companies, in their filings with the SEC, to disclose only proved reserves that a company has demonstrated by actual production or conclusive formation tests to be economically and legally producible under existing economic and operating conditions. We use certain terms in this press release that SEC's guidelines strictly prohibit us from including in filings with the SEC. U.S. Investors are urged to consider closely the disclosure in our Form 20-F, File No 1-32575, available on the SEC website www.sec.gov. You can also obtain these forms from the SEC by calling 1-800-SEC-0330.